Its news to no one, Whittard of Chelsea are famous for their tea, they serve over 100 variations, so I knew without doubt that a fabulous cuppa would be served. The tea bar itself, situated right next door to the Whittard flag ship shop, has a very relaxed, casual feel, almost like a cool cafe. Perfect if you are put off of trying afternoon tea as you think they are a little stuffy and formal. This is neither. Cosy bench seats adorned with cushions and the basement like structure of the building the tea bar is in, make it a cosy and casual venue. Whittard offer four options for afternoon tea, (you can see them all here) and range in price from £15pp to £30pp. 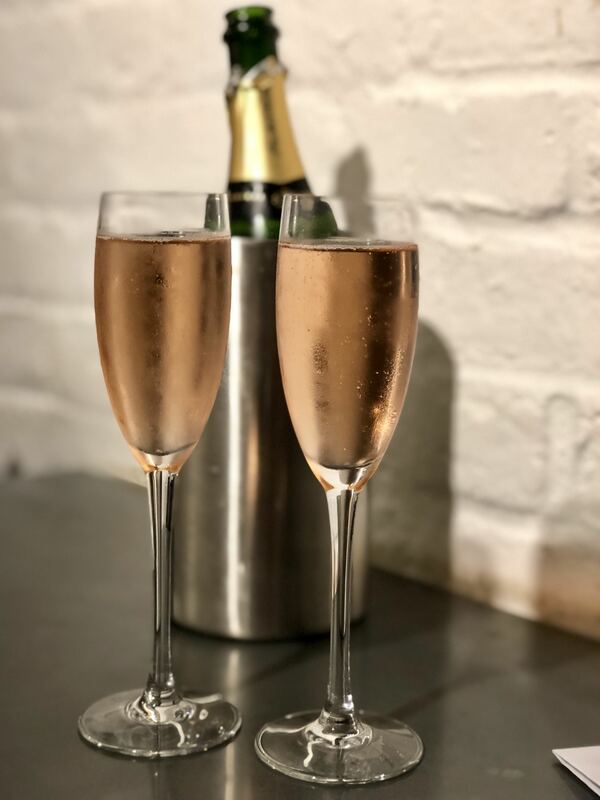 You can also add a glass of prosecco if you would like to! 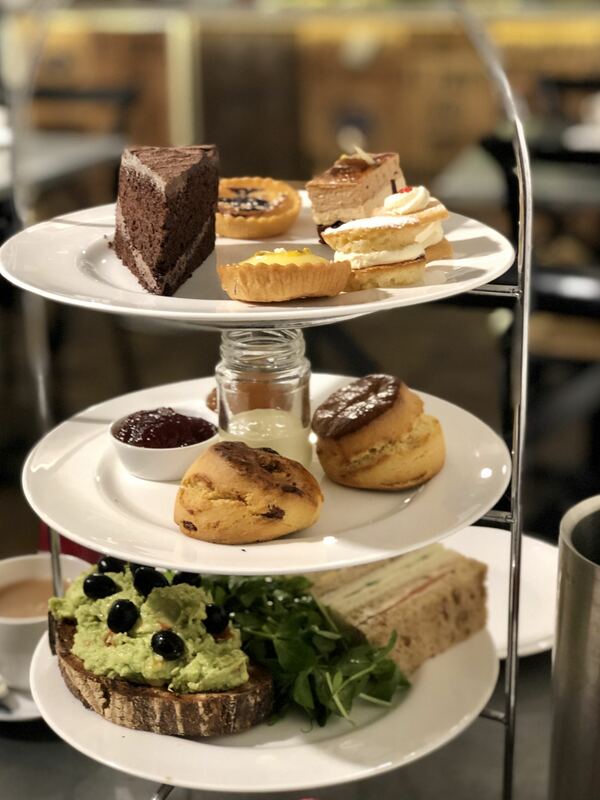 There are recommendations suggested for the tea pairings for each afternoon tea option, but of course you can choose your own from the huge selection. Mum and I were both served a cold glass of prosecco on arrival, that was mixed with a tea infused syrup. The syrup, made on the premesis by the tea bar manager Marta using the Whittard Strawberry Mint tea, was absolutely amazing. I think we could have happily stayed all day sipping many glasses of that, watching the world go by. Delicious! The choice of teas available is vast. As I said, there are over 100 blends available in the shop. You of course have the choice of coffee or hot chocolate too! Mum chose a traditional English Breakfast Tea, while I chose the Afternoon Tea blend on Marta’s recommendation, after telling her what sort of tea I liked. It was the perfect blend for me, she hit the nail on the head. It was a slightly smoked blend of black and jasmine green tea, with a hint of bergamot and floral. I love a cup of Earl Gray, so these sorts of blends are right up my street. It was gorgeous! Now, the only thing I do have to highlight here, is that at the moment, Whittard do not offer a vegan option with their afternoon tea. They do a vegetarian one, but not vegan. It is something that they are working on, but at this stage no full vegan tea. However, I knew this before I went, and was happy to just have tea and cake while Mum enjoyed afternoon tea with all the trimmings. 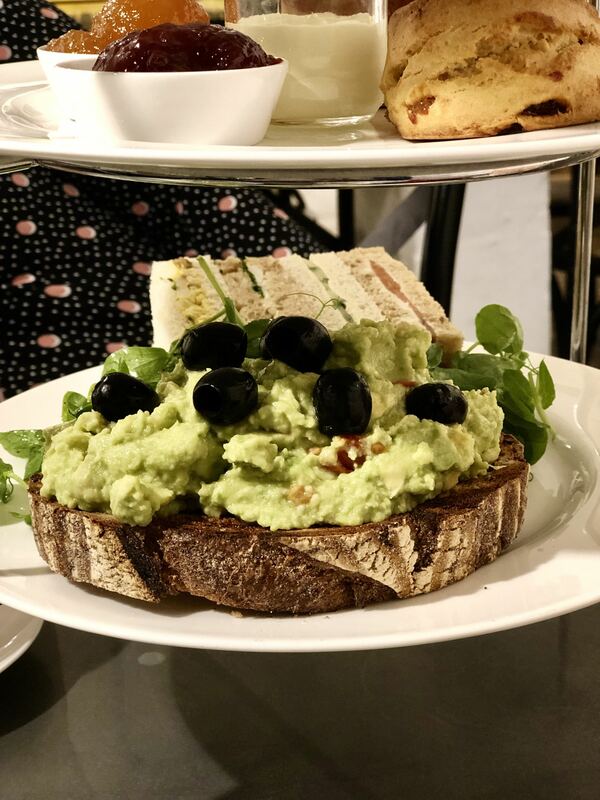 So, it was a lovely surprise when I arrived to find that they had made me a huge avocado and tomato open sandwich, topped with lemon juice and olives. It was beautiful and so delicious! I was also served the most gorgeous, velvety vegan chocolate cake, which was amazing! Again, it was a huge slice so there was no way I was leaving the tea bar hungry! Mum’s afternoon tea was beautifully traditional. Delicate finger sandwiches, warm scones with clotted cream and tea infused jam, little mini pastries and beautiful bite sized cakes. The sandwiches’s were filled with smoked salmon and lemon cream cheese, coronation chicken, cucumber and egg and cress. There were then five little cakes and tarts, some looking far to pretty to eat! Mum reported that they were all delicious, and so filling that in fact, she couldn’t finish them all. 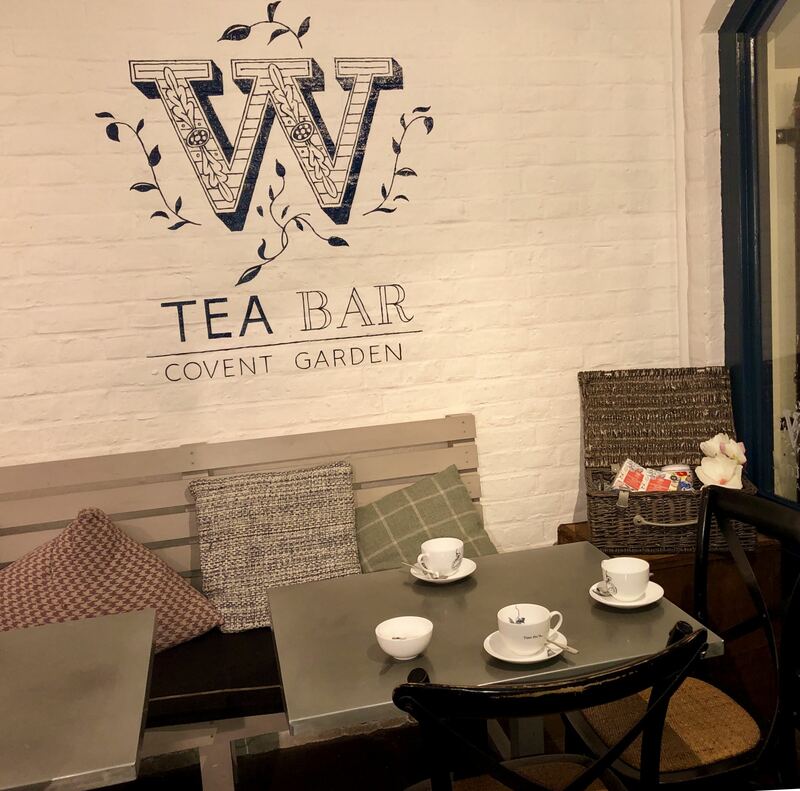 This little tucked away tea bar, in the heart of Covent Garden, really is worth a visit. 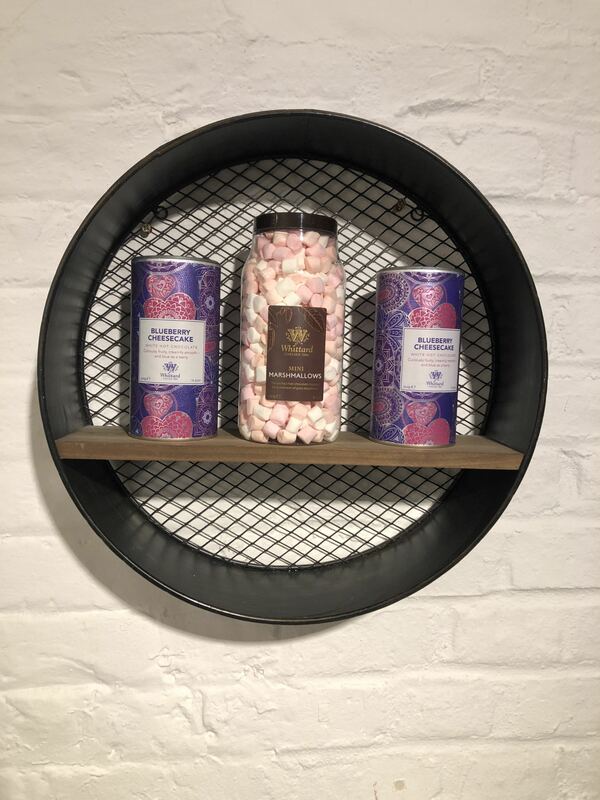 I think its the perfect place to take a breather from your shopping in the area, and enjoy something quintessentially English, but in a relaxed and more casual venue. The Afternoon Tea is served all day, so although it is recommended that you book, you can pop in on the off chance and get lucky with a table. You must of course, pay a visit to the shop next door. 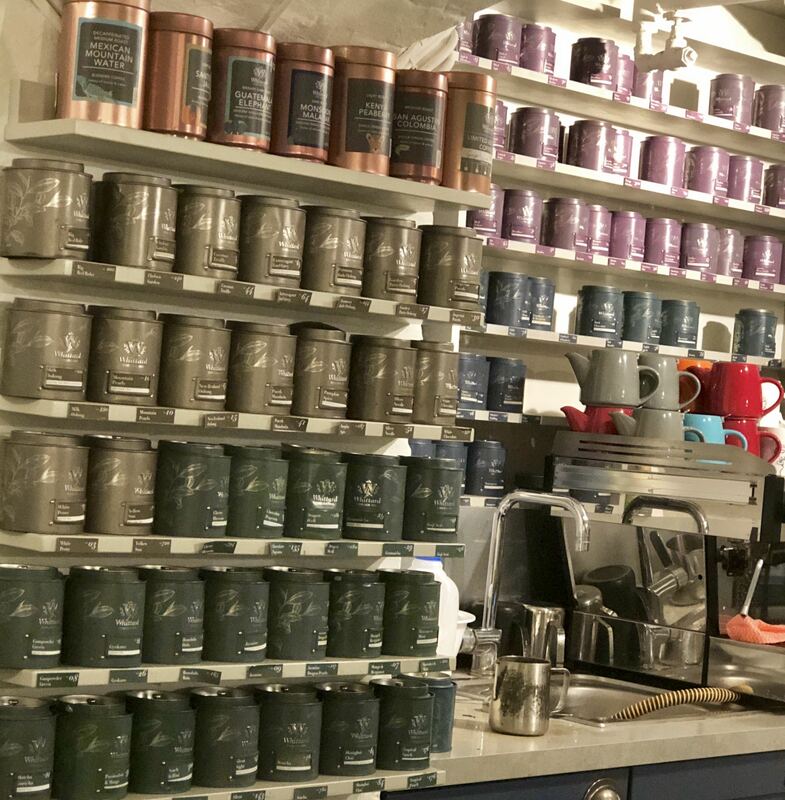 I could not resist, being the tea lover that I am, and I picked up some tea in a caddy, a tea diffuser and a pot of the Whittard limited edition Lemon Meringue White Hot Chocolate for Nik and the boys, (I almost came home with the Blueberry Cheesecake one too). I can tell you that it went down a treat and I am now officially the best Mum/Wife ever! There is also a gorgeous Queen of Hearts Tea for One that has been launched for Mothers Day that is just beautiful! So, there you have it. I have again, gone above and beyond my duty to you, in my attempt to try every afternoon tea in the land! The afternoon Tea diaries section of the blog has this latest addition. But don’t fret. I will continue with my duty, testing them all. Im here for you……. This afternoon tea was by invite from Whittard, in exchange for an honest review. Of course, all opinions are formed from my findings and words and photos my own. Are you a fan of this British tradition? Do you like all the pomp and ceremony of some places, or does this more relaxed vibe appeal to you? Equally as importantly, are you a fan more of the savoury offerings, or the sweet treats?? Let me know any of your afternoon tea experiences you have tried. "What Does Your Version of Blog Success Look Like?" Another afternoon tea you lucky lady! It’s all part of the job though, as you say. Hehe. Tea infused jam and tea in prosecco… oh my… I thought tea couldn’t get much better. Such a shame we only have the Whittard stores here, no tea bars or cafes. I’m more of the savoury treats kind of girl, although anything chocolaty has my name on it lol! I love the idea of offering coffee too – is this the first afternoon tea you’ve been to where they do this? I haven’t tried many of their teas, but the hazelnut coffee is good, as are the chocolate covered coffee beans! Have you by any chance already made a blog post on the absolute best afternoon tea sets in all of London? I’d be super interested in reading that particular post!